Business cards, like name badges, are wonderful introductory tools. They make it easy for people to learn your name and remember you. Additionally, they increase the likelihood that you will make a lasting impression and increase your chances for future work possibilities and/or appraisals. You may say your name once when you introduce yourself, however, some people may not know how to spell your name or read your writing. With a business card, they will be able to contact you in the future, refer you to others and be assured they have all the correct details. 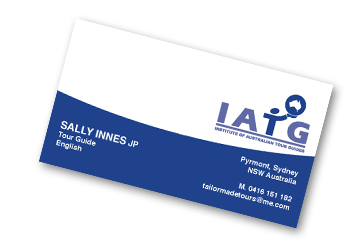 The professional and attractive design of the IATG business card makes it easy for people to see your name and recognise your Professional membership to IATG. IATG has created a variety of merchandise available to Professional members. Designed to enhance members’ presence in the tourism marketplace, the more members who wear/ display / hand out these IATG-branded goods the more professional we appear. The branding highlights you as part of an easily identified organisation – one that proudly displays its unity and experience under the umbrella of the IATG logo.